Author and President of Tootle Time Publishing Co.
Maryceleste Clement was born in New Iberia, Louisiana, and has always lived a merry if madcap life in the south. Silly and unusual things just seem to happen to her. In fact, that’s where she got the initial idea for her series of children’s books. In ordinary life (when there is one!) Mary and her husband, Tim, own and manage several oilfield service companies established under their parent company name, The Clement Companies. Mary’s role in the business is as Chief Financial Officer. Her degree in Business Administration from the University of Southwestern Louisiana has come into play in that regard. Mary’s flexible schedule allows her a good amount of time to attend to Tootle Time Publishing Co., which she and her husband also jointly own. Mary credits Tim with numerous contributions, from helping with story development to taking the lead in creating the Mr. Tootles puppet stage. 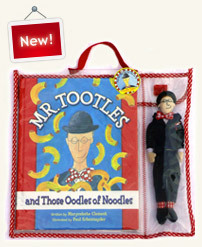 It took about a year and a half for Maryceleste to write, illustrate, and publish the first Tootle tale (Mr. Tootles and Those Oodles of Noodles), which debuted in 2002. Her second title (Mr. Tootles and the Polka-Dot Lollypops) took about a year to produce and was published in 2005. Her third title (Mr. Tootles and the Giggle Wiggles) was published in 2007. For Maryceleste, there are oodles of Tootle tales to tell and she looks forward to bringing out a fourth title in the not-to-distant future. Over the years, she has made numerous visits to schools and libraries where children delight in her stories. The Clements are the proud parents of two children, Tyler and Sarah-Ashley. They love to spend time together fishing, swimming, riding horses, and just tootling around. Paul Schexnayder was born in New Iberia, Louisiana, and much of his imagery is firmly rooted in the Acadiana folklore of his early years. His style is both sophisticated and childlike, blending reality and dreams into colorful, lyrical paintings. Schexnayder’s metaphors find their sources in the universal language of nature, architecture, food, and music that move in and around each painting. Schexnayder received his Bachelor of Fine Arts degree from Louisiana State University in 1988. He has shown in numerous groups, juried, and has had solo shows in Paris, Boston, Houston and New Orleans. His work is represented in galleries in New Iberia, Louisiana, and Galveston, Texas. Schexnayder was selected as the official poster artist for Festival International (Lafayette, LA) for 2008. Quite an honor!